This clever, heavy-duty bracket helps you easily hang wooden bird houses or bird feeders on posts or sheds. The base will screw into whatever placement surface you desire, and the connecting part attaches to the bird house or feeder. Together, they simply slide into place, and you're done! The clever easy-lift design lets the box be removed for checking or cleaning. The bracket is made of zinc-coated, rust-resistant steel, and can support up to 15 lbs. 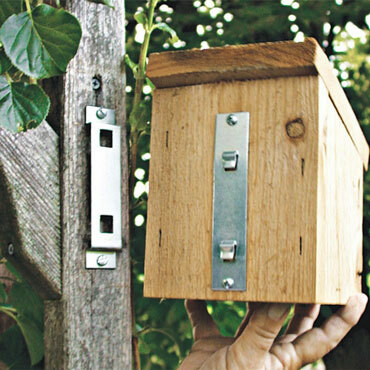 Use it to hang any of our line of wooden feeders, nest boxes, and bird houses, or use it with one of your own design.